Bristol Airport is planning a major expansion which could see it provide more long-haul routes for passengers from 2018. Following the return of direct flights to Florida and Mexico this summer, and the announcement of flights to the Dominican Republic next year, the airport has reaffirmed its ambitions to secure further long-haul destinations. The airport’s runway is certified for code E aircraft, which allows for trips to North America, the Caribbean, the Middle East and parts of the Far East. Daily departures to New York operated in the past, before being scrapped in 2010 due to the retrenchment of the airline market. However, the airport’s subsequent growth suggests additional longer trips are a realistic prospect once again. Airport bosses will consult on initial priorities for a new master plan later this year, and will seek views on how to meet demand for air travel to and from the South West over the next 30 years. Nigel Scott, the airport’s business development director, said: “The strong short-haul network available from Bristol is a real asset to the region we serve, but we know businesses in the south west are also looking beyond Europe for new opportunities to trade. “That is why we are working hard with existing airline partners to increase the frequency of services to major hubs, as well as exploring the potential for more direct long-haul services east and west. Major investment in the South West, including the development of Hinkley Point C in Somerset, is expected to further boost demand for business travel to and from the region. Initiatives to promote inbound tourism, such as the recently announced regional gateway partnership between Bristol Airport and VisitBritain, are set to increase the region’s profile in overseas markets. Currently the ninth busiest airport in the UK, Bristol saw passenger numbers pass the eight million mark in 2016, and is the only major UK airport to have increased passengers every year since 2009. The airport is celebrating 60 years at its current Lulsgate Bottom site this year. Bosses at Bristol Airport are considering a number of expansion plans such as adding an extra terminal to the site. The airport – which flies to more than 100 destinations – estimate passenger numbers will increase to 20 million a year by the mid-2040s. The company is looking to carry out a multi-million pound upgrade to further modernise the facility for the next generation of passengers and planes. It is asking members of the public to provide feedback on three separate scenarios which include the possibility of a new terminal, more car parks, more hotels and an ‘employment’ zone for businesses. The plans are not set in stone, rather they will inform the airport’s 2050 development plan. Bristol Airport’s planning and sustainability director, Simon Earles, said: “We are in the heart of a very exciting time for the region as the four councils [Bristol, North Somerset, Bath & North East Somerset (B&NES) and South Gloucestershire] develop a joint spatial plan and joint transport plan, and we too want to be a part of that development and improvement. “We estimate that our passenger numbers will continue to increase by 10 per cent a year and we also want to attract some of the 7.5million passengers from the West of England who use airports in the South East. Notable by its absence is a proposal to increase the length of the existing runway or adding a second runway. “We are primarily a short-haul and European destination airport and the size of the aircraft that use the airport can cope very well on the existing 2,000metre runway,” Mr Earles said. Opened in 1957, Bristol Airport has seen a steady increase in passenger numbers and destinations. The last master plan was created in 2006 and it has gradually implemented improvements including a new car park and terminal expansion. 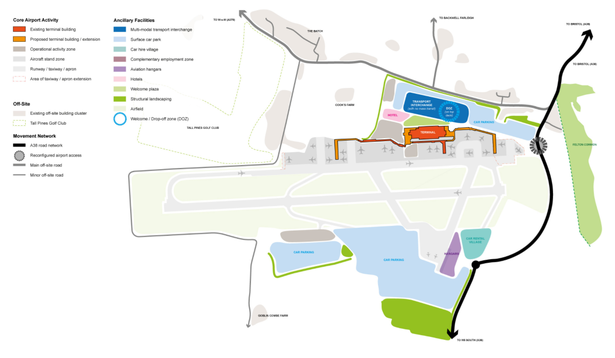 Alongside improvements to the site, Bristol Airport will be relying on North Somerset Council and the West of England Joint Committee to upgrade access to the airport by either widening the A38 and/or providing new bus or train routes. The consultation is the very first stage in the creation of a new master plan for the airport. Once the survey closes at midnight on Friday, January 26, the company will assess the results and use them to create a draft plan in spring next year. Any expansion would require the airport to purchase additional land and submit planning applications to North Somerset Council. Posted: Thursday, December 14th, 2017. Filed in Blog, General News, News about Airports, Recent News.